Following the feedback from LabSuit users in Talinn, Estonia, we have simplified the way LabSuit works in certain situations. 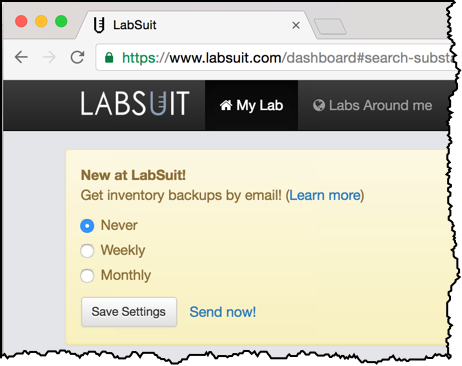 Pavel Starkov, a PI from Tallinn University of Technology says: "Once in a while an Internet outage may occur, but we need our inventory at LabSuit to be available offline as well". Impossible to overrate being said, we realized something has to be done. What we did is added automatic emails, that are sent out periodically and include your inventory back-ups (Excel file). To start off, there will be two options for emails periodicity: WEEKLY basis and MONTHLY basis. It's recommended to use the MONTHLY option, just not to blast you inbox, though if your inventory is updated often, for example daily, you may want to take back-ups on WEEKLY basis. 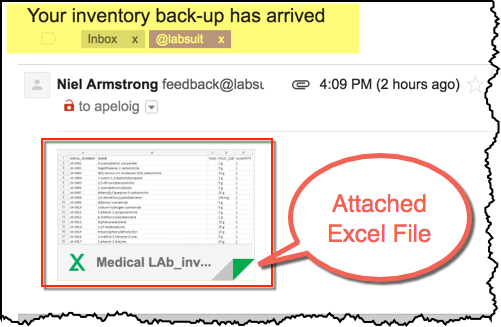 The good thing about periodic inventory backups is that it's not limited just to lab managers, but every lab member can have inventory backups delivered to his/her email. In addition, periodic inventory backups may be used as historical logbook: the inventory history can be viewed 6 months back or even a year back from now!